Bangkok truly deserves the honor of being the capital of Asia. Because the number of tourist attractions, culture sites, entertainment venues, high quality services and how friendly and laid-back the Thai people are. Not only Bangkok hotels are luxurious and cheap also the hotel offering is one of the best I have seen anywhere in the world. Here I present to you my compilation of the top 30 best located Bangkok hotels. The luxurious Mandarin Oriental sits beside the iconic Chao Phraya River in downtown Bangkok. Rooms have uniquely teak wood and Thai silk decoration and large outdoor pool is also great. Moreover, Thai cooking and Yoga classes are available. Everything is down to perfection at Mandarin Oriental, not only the hotel is beautiful also the staff is very attentive and work very hard, so is not strange that Mandarin Oriental ranks at the top of any hotel list. Pure luxury, not to mention it comes with a hefty price tag also. Mandarin Oriental at River side, in my opinion the best hotel in Bangkok. Chao Phraya river view from the hotel. Infinity pool!. Do I need to say more? :). Ok, ok the pool is quite small, actually, nothing compared to the ridiculously spectacular infinity pool of Singapore’s Marina Bay Sands. But Marina bay sands doesn’t have a cool Japanese name. This hotel features 250 rooms and 3 restaurants. I do like the decor and the details, and of course the cleanliness. Finally I like the Japanese feel and that is also its in an area that I enjoy, Sukhumvit, near Ploen Chit BTS. Okura prestige view from the room. The infinity pool I mentioned before. One of the best hotels I have seen to this date. The staff of the hotel is very friendly and helpful. Even for the already high Asian standards, so the level of service in this hotel is outstanding. Due to the smart layout all the rooms face around a quiet garden, the hotel has a resort-like atmosphere, yet in a very convenient place close to the bustling scene of the Siam district and Paragon mall. Big windows are good, but equally good curtains are much-needed to block the sun. I have to admit that I love Shangri-La Hotels, and who doesn’t, they are superb. If only my wallet could share my enthusiasm. I stayed here back in 2014 and everything was so shockingly good. Room is nice even on the basic room, but the real luxury begins on the upgrades, suites and such. Good service coupled with good facilities makes this hotel wonderful. Also this hotel was one of the top ten hotels in the world. The only con ( and its only a matter of personal taste), is the characteristic Shangri-la floor-carpet. I prefer well polished wooden floors, but hey, no biggie ;). The Shangri-La Hotel stands on the east bank of the historic Chao Phraya River, while providing easy access to the many attractions and the nearby Saphan Taksin BTS Sky-train station. The pool is amazing, and people can see you sunbathing from the river boats. Full of jealousy I assume. On average this Lebua State tower hotel is over 100$. However, sometimes the hotel is available for less than 100$ per night. This hotel rocks, and it features a much famous rooftop bar: Sirocco. This bar appeared in “Lost in Bangkok” movie, in fairness, Sirocco bar was well famous before the movie. Views are impressive, tourist come here just to enjoy the rooftop bar and celebrate special occasions. I love the views, but hate the inflated prices… Yes, its expensive. State tower is the tallest building at Bangkok, if I’m not mistaken. Sirocco Sky-bar. The real reason to come here. Cape house is a service apartment focused to long-stay guests ( Japanese guests mainly ). Generally speaking I found the ambience quiet, my one-bedroom suite on the higher floor had a nice living room, coupled with a dining table, washing machine, and the nice king-sized bed. Furthermore the hotel location is convenient, a mere 5 minutes walk to the nearest BTS station. The staff was very polite and always greeted with a smile. There’s also a lounge area with tea/coffee and light snacks being served throughout the day. The swimming pool and Gymnasium are a bit small and worn out, but no complain. I do recommend Cape House to friends that are looking for something simple, nothing fancy but centrally located. Pool could be better, but still good. Maduzi Hotel Bangkok is a boutique hotel 10 minutes walking from Terminal 21 and Asok BTS. So it is close to the tourist hot spots like Soi Cowboy, Terminal 21 and Nana. Room is nice and the hotel is not far from Lumpini park. In a word Grande Centre Point is a service apartment that counts with spacious rooms, kitchen, washing machine and other amenities. Not only extremely comfortable for long stays but also handy for short trips. This hotel is huge and the corridors sometimes smell of food. Altogether a good hotel and well located hotel. In a word probably the cheapest 4.5 star boutique hotel in the city. The pool is… slim, rectangular to describe it best and there’s a Jacuzzi as well. However the hotel is at Sukhumvit 3 and is convenient for those who want hit Nana at night. Generally speaking Ad lib Bangkok standard room looks good and clean. A decent choice for staying close to Asok. I haven’t stayed here so I can’t say a lot. But the hotel is very highly rated and has a very peculiar modern decor. Modern pool, let’s say just that. On Sukhumvit Soi 49, I highly recommend this hotel. All the rooms are actually suites of high quality. Even the most small suite has 50 sq.m, refrigerator and washing machine (!). Executive suites have kitchen, I doubt guests paying 150$ a night really do need a kitchen, but hey. It’s still pretty cool, most especially the refrigerator is always handy. Equally good was the lovely breakfast and I’m impressed with the quality of this 4 star hotel, real bang for buck. Washing machine for long stays is really handy. This Thai hotel chain is well know they also have hotels in Pattaya, Manila , etc. The Thai vibe in this hotel is notorious, if you been there, you know what I mean. They feature a Thai theme so expect flashy Thai decor and flavor. A mere walking distance to Sala Daeng BTS and Silom MRT station. Moreover is near Silom Road night market, a great base for partying. A round pool is the way to go, believe me, I know. 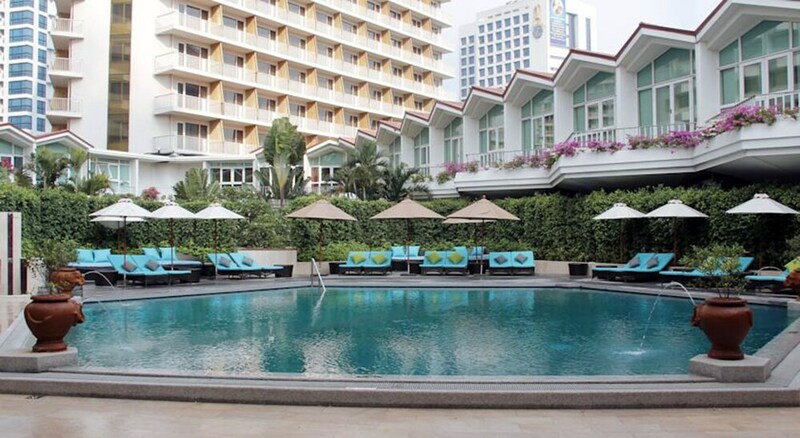 Park place is a 4 stay hotel and is a great choice for staying beside Asok. This hotel goes for as low as 50$, discounted from 250$ (not sure if to believe that). But what I can certify is that the room in incredibly amazing for such a low price. One of the best finds i had in Bangkok, not to mention maybe the biggest bang for buck hotel here. As a matter of fact one of the biggest bargains I have seen in Bangkok. There’s nothing grand about confusing your hotel. Bangkok has a few grande hotels (five at least come to mind), don’t get it wrong!. This 5 star hotel in Ploen Chit has spacious rooms and sometimes is under 80$, pretty cheap, thus good value for money. I hate this kind of carpet with all my guts but at least no slippers needed. I remember this hotel dearly, as it was my first 5 star hotel stay in Bangkok. First, the rooms are so well designed, wooden floor is flawless. Secondly, the pool is good but nothing spectacular. Finally, the food was delicious as it usually is in this kind of hotels. Many guests choose this hotel for monthly stays, ( namely a lot of Japanese tourists). Finally the surrounding area is also very nice, Thong Lo is well-known, most noteworthy for its Thai street food and the bistro music bars. Picture doesn’t do a lot of justice to this hotel here, the room itself looks WAY better. Refrigerator and sofa are nice too. Kitchen is convenient for long stays and all cooking apparel in included in the room. Tints of Blue is a newly renovated boutique hotel at Sukhumvit area. Generally speaking I love the design and how everything feels new here. The hotel is not far from Soi Cowboy, so yeah, is also a guest friendly hotel, but a fairly quiet one. Because this place only features 40 rooms is a quiet hotel. Terminal 21, Health land, Asok BTS, Sukhumvit MRT are also nearby. And is not super expensive, so this is a great choice overall. A friendly and well designed boutique hotel. Pool is more like big bath tub but is always good to have the choice :). Citrus at Suk 11 is a four star hotel 10-minute walk away of BTS Nana Station or Phloen Chit BTS. Furthermore the rooms look good, clean and really spacious. Swimmers beware that this hotel seems to not have a pool. A room looking this awesome for under 40$. I said it before, real bargains in Sukhumvit 🙂 . 14 Square meter boxes… er…rooms, so rooms are little boxes as the hotel name suggest. Not my cup of tea, but is a decent option for less than 30 $ for those who don’t suffer claustrophobia. On the good side the rooms are beautiful and well designed. Needless to say no pool in here. S. Stands for small?, just kidding, but it might as well be. The decor is a bit outdated but every thing was well maintained and all functioned well. The site is super close to the market and the sky trains (Chong nonsi BTS, Sala daeng BTS), in the heart of Silom. Hence good street food and entertainment nearby. My stay at the Hotel Mermaid was excellent. In brief, I booked a corner room with a spacious window and a balcony. The bed was soft and had big 4 pillows that had just right softness. Moreover, the swimming pool was clean and refreshing with nice padded lounge chairs and towels provided. Also the hotel is well-connected to Asok BTS and Phrom pong BTS. I highly recommend the nearby Japanese restaurants around Suk 33. As a matter of fact Sukhumvit and Khaosan accumulate plenty of hotel bargains for under 50$. so WHERE SHOULD I STAY next time i visit Bangkok? Understand Bangkok: In short, Old city packs the more important of sites. Khaosan, Silom and Sukhumvit together with Nana have the Nightlife. Siam and Sukhumvit have the shopping. Riverside is more upscale. All things considered this might guide you, but of course there’s a bit of everything scattered anywhere in the city. If you are mainly looking for Nightlife entertainment, but with some occasional shopping and sightseeing I would stay in Sukhumvit or Silom. There are so many bargains at Sukhumvit area, 4 and 5 hotels for low prices. Best shopping in the city. A bit of everything in here. Best bang for buck hotels. Terminal 21!. I’m seriously in love with this mall because the food is so epic and mall is so trendy. Food court at the top floor is one of my favorite eateries in Bangkok. Slightly far from other important venues, IE: riverside. You will have no choice to use the transport often. Traffic is heavy if you opt for a taxi. Sukhumvit is my favorite area hence i usually choose to stay there. Simply because Sukhumvit is well-connected, shopping is good, and Sukhumvit has the most affordable luxury hotels. Especially relevant is the street food in Thong Lo (Epic flavors), and the bistro music bars are great too. Chao Phraya is the iconic river that crosses Bangkok. I highly recommend taking the ferry that goes to Asiatique Riverfront. From the boat, one could admire the 5 star Bangkok hotels that fill the river bank. While if you stay on these hotels, you will have enjoy privileged scenic views of the Chao Phraya river. River side area is noteworthy for packing , without any shade of doubt, the most luxurious and impressive Bangkok hotels. Good for couple travelers and honeymooners alike. Good for families looking for a resort-like holiday. Good for wealthy travelers that don’t mind the prices. It’s a more relaxed area. The Grand Palace together with Wat Phra Keaw. All in all the number 1 must see in Bangkok and the true icon of the city. Wat Arun temple. A much beloved temple, not far from the Grand Palace. Take a cruise to Asiatique The Riverside. Taking a cruise at the Chao Phraya river. There’s a bunch of cheap hostels in Khaosan road. Consequently attracts mostly young people, local’s, and a variety of strange foreigners alike. The place itself is an attraction, very noisy at night with colorful clubs, restaurants, bistros and shopping. Hence a great place for those who love to party. Consequently, i enjoy coming to Khaosan for an occasional night out and drink with friends. But the problem is reaching this area is not convenient. Good for drinking and night out. Plenty of services and shops aimed for tourists (laundry, ,internet coffee shops, currency exchange). Lacks public transportation. Can be tricky place to reach. Taxi driver’s will try to rip foreigners off. Seems like some people regard Khaosan as unsafe, however I cannot say that much from personal experience, everyone should pay extra attention to safety. Note: I have to admit I’m not a Khaosan expert, so if you have a better hotel suggestion for Khaosan area I would appreciate you drop me a line in the comments section, and I will update this table :). If staying in Khaosan is particularly important for you, check this link : khaosanroad.com. MBK has everything tourists go after: loads of restaurants, bowling alleys, cinema theater, etc. Furthermore MBK is an institution in Bangkok, hence a must visit while at Bangkok. Siam Paragon is the most upscale class Shopping mall in all of Bangkok, maybe Asia. Hence Siam paragon is considerably more luxurious than it’s neighbor shopping centers. Siam Paragon is one of the largest in Asia, features more than 250 stores. Everything here is luxury oriented featuring the world’s most well-known luxury brands. Louis Vuitton, Prada, Channel and all that jazz :). There’s also a Gourmet Market worth the visit. Glitzy, huge, and recently renovated. Central World plaza is yet another mind-blowing huge shopping mall. Shopping variety is good and the food court is also pretty good. A branch of the British Madam’s Tussaud wax museum. People come here to picture themselves with their favorite “stars”. Because the wax statutes are amazingly well done and have a very realistic touch. I for one, pictured myself with a wax Nicolas cage and nobody could tell the difference :P. Still, i found it odd how this place is so quite popular among Bangkok locals. A Hindu shrine hiding the famous statue of four-faced Brahma. I love this temple, because is very small but beautiful. Erawan is a small temple so the visit could be done in less than an hour. Yet amazing, Hindu flavor. Jim Thompson was an actual traveler in Thailand that came up with the idea of establishing the silk industry in Thailand, although he got lost in the Malaysian house you can still visit his nice house in the Siam neighborhood. Great for shopping and eating. Less hotel choices in here. Traffic is usually heavy in this part of Bangkok, expect traffic jams if you opt for taxi. All in all one of the best rated hotels in the city, i mentioned it in the beginning of the article. Easily confused with “Lit Bangkok Hotel”, but is not the same thing. LiT Bangkok Residence is a 48 boutique hotel near MBK Center, Siam Square and the Jim Thompson House. Bangkok boutique hotels are another perk of this city :). Just beside National stadium BTS station. LiT Bangkok is an all suites hotel oriented for long stays and such. Again, don’t confuse this hotel with almost identically named Novotel hotels in Bangkok like the one in Bang Rak. Novotel is a cheap option for staying in Siam. Gym and pool are good but nothing outstanding. Novotel is an affordable choice for Siam Square, however the room does not have enough punch, in my opinion. Novotel sits south of beautiful Siam square and is the real reason to stay here. I discarded any hotel with less than 20 guest reviews. Aimed for 5 star and 4 star hotels with good price. Still, Bangkok have some great 3 star hotel offerings. I discarded all 1 and 2 Star hotels. Hostels being the exception. I discarded any hotel with less than 10 rooms. Discarded any hotel that has not been renovated in more than 10 years. Finally I didn’t consider any badly located hotel, those in any uninteresting areas or very far from the Sky-train and subway ( BTS, MRT). And got a last round list of around 250 matches. Hotels.com uses a score scale of 0 to 5, so i multiplied the score by 2, to match Booking.com and Agoda.com which use a scale from 0 to 10. Bangkok has a more 2000 hotels. There is a “hotel” in Bangkok with only just 1 room. 3 Star hotels are unusually are highly rated vs. 5 star hotels. There are about 100 Hotels in Bangkok with average rates of over 100$. Conversely, there are at least 35 five-star hotels usually rated under 100$. Does all the Bangkok hotels have English-speaking staff ?. Yes, even the modest 3 star hotels have English-speaking staff. So almost any 4 and 5 star hotel in Bangkok would have English-speaking staff. I’m still confused, recommend me one hotel that won’t disappoint?. Shangri-La for Luxury. Cape house, and Ad Lib for under 100$ and for long stays aswell. Adelphi 49 and Hotel mermaid for under 50$ for hitting lower Sukhumvit. And Citrus suk 11 for staying beside Nana entertainment plaza. What time of the year is High-Low season ?. November to February is high season yet Bangkok is busy all year round. Cold weather in Europe means high season in Thailand because of the hordes of European tourists seeking good weather in the land of smiles. Furthermore Songkran festival is a peak holiday. Low season is cheaper but the problem of low season is rain because it might shower on a daily basis, like at August. How many days should I spend in Bangkok ?. I would say 2-3 nights for a super tight quick trip. For me, 4-7 nights can comfortably cover everything. Because keep in mind that there is plenty of good things to see in Thailand, outside Bangkok. Best massage place in Bangkok?. Health Land Sathorn, 120 North Sathorn Rd (10 minutes walk from BTS Chong Nonsi). Health Land Asoke, 55/5 Sukhumvit 21 Rd (10 minutes walk from BTS Asoke and MRT Sukhumvit). Health Land Ekkamai. 96/1 Soi Sukhumvit 63/Ekkamai (15 minutes walk from BTS Ekkamai). Health Land massage is extremely popular in Bangkok. Anytime I go to Health Land Asoke I have to wait at least 20 minutes. Luckily they have a comfortable waiting area, and tea is offered so I can just chill and sip tea. The place looks like a huge retro mansion. Also, the quality of the Massage itself will depend on the masseuse ability, of course, so cross your fingers for a skilled therapist 🙂 . Staff speaks English albeit just rudimentary. Booking in advance is possible, albeit might be confusing. Located on Sukhumvit 24, 31, 55. 400 Bath for 60 minutes. Quality is good. Small massage shops. Scattered all over Bangkok. This shops are either hit or miss, usually a miss. However i remember having in one of these the best foot massage i ever had for like 200 THB. They are the cheapest option. Oh and some look seedy, because indeed they are very seedy. Best restaurant in Bangkok ?. L’atelier de Joel Robuchon. French fine dinning. Elements at Okura prestige hotel cuisine. Gaggan. Indian cuisine. I remember this restaurant was voted the best in Asia not long ago, of course with a 3500 THB ++, luxury doesn’t come cheap. Le Du Silom Restaurant. Modern Thai. Location: 399/3 Silom Soi 7. Little beast. American, Tapas. Location: Little Beast Bangkok, Thong Lo 13. Soul Food. Thai food. Thong Lor. Appia. Italian food. Located at 20/4 Sukhumvit Soi 31. Additionally for ultra cheap, clean and usually delicious, try the food courts at the big malls top floors. Street food won’t disappoint if you are adventurous. Where can i find the famous Bangkok street food ?. Chinatown. Small stalls selling barbecued seafood awesomeness altogether with some interesting restaurant options. Located at: Thanon Phadung Dao (Soi Texas). Sukhumvit soi 38. Plenty of carts and stalls that line the road and the occasional friendly soi dog jogging by in search for scraps. Also Thongs Lor BTS is not far. Old City ( Rattanakosin). Pad Thai is great here. Bang Rak. Roast duck, crispy pork, rice porridge, pork dumplings, green curry with Roti, baked breads and so much more. What else to see outside Bangkok ?. Chiang Mai / Chiang Rai. In conclusion the hotels in Bangkok are generally cheap but of great quality. The locals are generally charming and friendly, and everything is more slow-paced than usual. Me, like many other tourists, fell instantly in love with Bangkok since my first visit. Also the number of foreign tourists is huge and this has changed on how Thailand locals see us foreigners. Moreover the city is rapidly changing, but as of today Bangkok and Thailand is still Tourist heaven. So do you guys have more questions or suggestions?, which Bangkok hotel did you enjoy the most on your last visit to the land of smiles?. Feel free to write or ask me anything in the comments section below. And like or share if you enjoyed the article. Ps: Prices are for reference only, they vary constantly. Siargao ultimate guide! What to do and where to stay guide for non-surfers.